You met your perfect match; the one you dreamed of when you wrote that job description and crafted the ad. The one you hoped would see the job when you shared it on social media. You prayed for a perfect fit as you read through countless resumes, cover letters, and fielded phone calls. You put out your best self for every interview. Or, maybe you hired a search firm to make life easier. Regardless, both routes mean that you’ve invested a lot of time, energy and resources to fill this job. Finding that perfect match is no easy feat, and the last thing you want is to be rejected; there’s too much at stake. According to a 2016 SHRM survey, the average cost-per-hire is $4,129, while the average time it takes to fill a given position is 42 days. More useful metrics can be found in the Society for Human Resource Management’s (SHRM’s)Human Capital Benchmarking Report. 1. Ask what they are looking for, up front. When setting salary, consider what the job is worth and the skills and experience they are bringing. It’s still nice to know that your offer will be attractive, so it’s fine to ask what salary they are seeking, or even better, what would be important to them in a compensation package. Maybe salary isn’t the end all for them. Know what’s important. A flexible schedule, PTO, benefits, or even culture could be the real drivers. 2. Make the offer in person or on the phone. This can be the hiring manager or HR representative, depending on the culture of the organization. I like the HR representative to make the offer, because it gives another touch point for the candidate. The more touchpoints and connections they have within the organization correlates with successful onboarding and early engagement. 3. Send a “wow” offer letter that reflects your culture and confirms their acceptance. Spell out the details: what’s the job title, who’s their manager, when you expect them to respond with their answer. One company specializing in outdoor recreation changed titles from Customer Service Representatives to Adventure Agents to better reflect their fun culture. Celebrate the salary and benefits by highlighting them in the letter with bullets. Let them know what’s in it for them by coming to work with you. Now that you’ve proposed in an enticing way, well done! Getting your dream colleague to say “yes” and accept your offer is to be congratulated. Getting them to show up and contribute is yet another matter. Look for part three of this series, on how to Keep the Love Alive-Successful Onboarding. If you need to know how to find your best match, see part one, Love at First Sight Can Lead to Engagement. 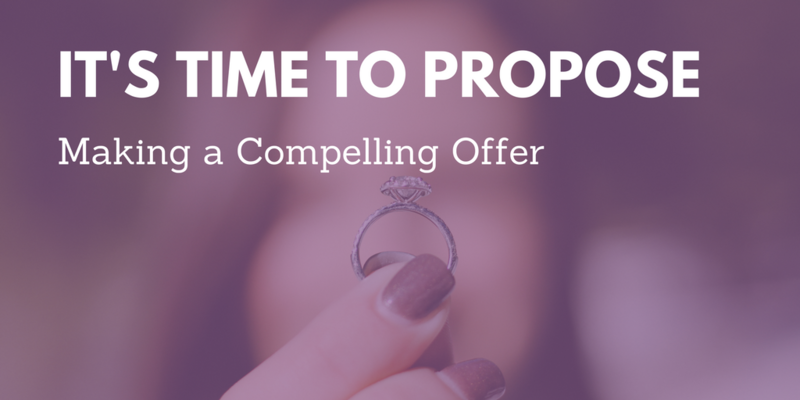 Need some help crafting the perfect offer? Reach out to Purple Ink – we’re here for you!